Dinah Skirt - Pretty In Pink Flamingos! We love a skirt just as much as we love Flamingos! The Pretty In Pink Flamingos Dinah Skirt is brand new this season, and is nothing like we’ve seen here before at Lady V! 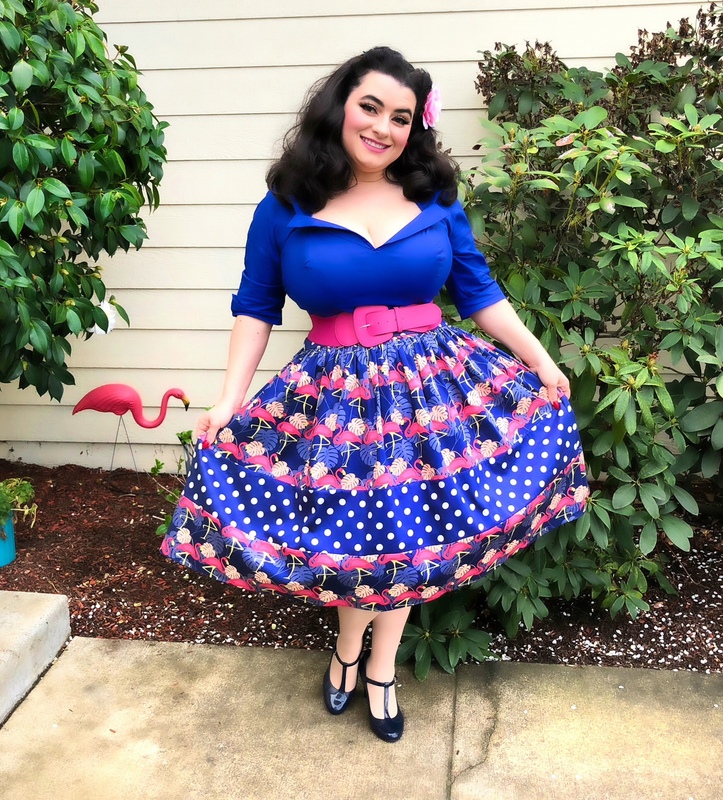 This zany little number boasts an array of fantastic bright pink Flamingos and palm leafs, as well as a pop of navy blue and white polka dot print in panels around the waistband and middle of the skirt! This voluminous skirt can be worn for both casual and formal occasions - and a petticoat underneath will really highlight the fifties inspired look! The funky Dinah skirt measures at 25.75 inches from waistband to hemline, in a size 8. Fastened on the back with a zip. Available in sizes 8 - 22.